Scythebill 10.5.1 - IOC 4.3 release! Scythebill 10.5.1 is here! Download it here, and please follow Scythebill on Google+ or Facebook for updates. This release is out today to get the release of the IOC 4.3 world taxonomy into your hands. This taxonomy was only released today! Scythebill now lets you enter feral and wild Rock Pigeons separately. In Clements, this takes the form of two new groups ("Feral" and "Wild"); in IOC, just a single subspecies ("f. domestica") is added. 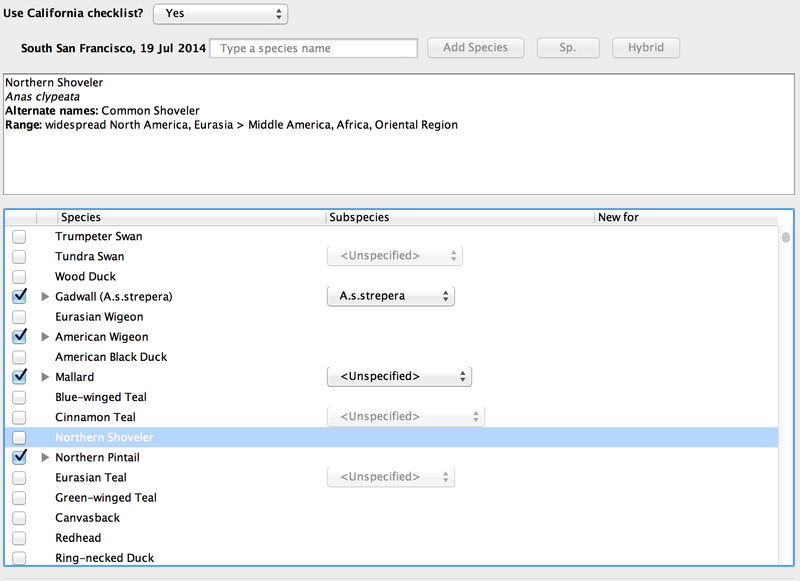 Scythebill will also export these forms to eBird correctly. Thanks to Frederik K. for the idea! Scythebill exports containing eBird groups - like "Yellow-rumped Warbler (Myrtle)" - should now import into smoothly into eBird. Scythebill now supports importing life list files downloaded from eBird when your eBird settings for "Species name display" is set to "Both common and scientific". In North America, Kansas, Iowa, Massachusetts, Nebraska, Nevada, and South Dakota, as well as Nova Scotia have been cleaned up, including rarities. There's now an Aruba checklist! A number of corrections have been made to Africa. Elachuridae: a single species, once known as Spotted Wren-Babbler but now known as a basal passerine with no close relatives. So, if you haven't visited New Guinea, there's 5 new reasons to do so! Scythebill 10.5 - a manual, better checklists, reporting, and more! Scythebill 10.5 is finally here! Download it here, and please follow Scythebill on Google+ or Facebook for updates. It's taken a bit longer than I expected to ready (life and work have intruded!) A huge thanks to all the users that sent in bug reports and lots of great ideas for new features. If I didn't get to your requests in this release, rest assured I haven't forgotten you, I just had to draw the line somewhere. I'm proud of how many users have been able to learn and use Scythebill without any sort of a manual, but I'm sure even the most adventuresome users will find something they didn't know existed. Scythebill's checklists, first made available in 10.0, are even better in Scythebill 10.5. Checklists have been reconciled with the official lists in Mexico, Panama, South Africa, and the United Arab Emirates, as well as the US states of Alabama, Alaska, Arizona, Arkansas, California, Colorado, Idaho, Illinois, Louisiana, and Oklahoma. (Thanks in particular to Bill D. for help here with several of those states.) There's also lots of African corrections from Joël R. and Niall P., and Tanzanian and Australian corrections from Steve C.
Finally, you can now send me corrections to built-in checklists in a form I can easily incorporate back into Scythebill. Read about it here in the manual. If you're wondering how you can contribute to Scythebill, this is a great way to help out. What are the earliest and latest Spring migrants to arrive? What are the last species to depart in the winter? What was your 500th or 2000th or 5000th lifer? What species have you gone the longest without seeing? There's a new Southern Africa region for the African listers out there. You can now bulk edit locations in a report, so if you accidentally put a few hundred records in Swaziland instead of Switzerland, it's easy to fix. The Scythebill import format has proven useful for getting data into Scythebill. Users have taken advantage of it to get data out of Wings or custom Access databases. And it's even easier to use now. In particular, almost all of the columns are now optional. You can import with a mere three columns of data! One (or both) of "Common" or "Scientific"
and "Date" can even be blank! Scythebill's now greatly improved at keyboard interaction, particularly when entering sightings. Tabbing is much more predictable, keyboard focus should be visible in many places it was not, and keyboard focus doesn't disappear in annoying ways after adding species or changing subspecies. And species entry is much better at keeping the field you're working with entirely on-screen. There's even keyboard shortcuts to simplify moving around the table. Some rarer (and harmless) bugs reported by Melissa H., Harry R., and Peter W. have been expunged. Barring the discovery of any particularly interesting bugs, the next update is likely to be for the IOC 4.3 release. And I think the feature at the top of my stack is per-report fields - protocol, start-time, duration, and comments. Long missing, much needed. Scythebill 10.4 - IOC 4.2 support! Scythebill 10.4 is now available! Download it here, and please follow Scythebill on Google+ or Facebook for updates. Scythebill 10.4 includes the IOC 4.2 checklist and a few small tweaks and bug fixes. "Western Puffbird" is demoted to ssp. obamai of Striolated Puffbird. "Xingu Woodcreeper" is demoted to ssp. retentus of Amazonian Barred Woodcreeper. "Bamboo Antwren" is demoted to ssp. oreni of Ihering's Antwren. In addition, I've preemptively added Tropeiro Seedeater to the Clements/eBird taxonomy (and the Brazil checklist), as this newly described species in IOC 4.2 will almost certainly be added in the next revision of Clements/eBird. A couple of small issues in Browse by location were resolved - a particularly dangerous one allowed users to inadvertently add "sightings" of families, which led to a variety of problems. Small checklist improvements were made to Serbia, Spain, and Brunei. Scythebill 10.3.0 is now available! Download it here, and please follow Scythebill on Google+ or Facebook for updates. How many lifers have you ever gotten in Peru? What new birds did you get for your ABA list in 2010? What new subspecies have you recorded this year? Lifers show up not only in the report screen, but also when you print or export to a spreadsheet! If instead of highlighting, you only want to see those first records, change should be... highlighted to included. This feature works with the "Remembered reports" feature from the last Scythebill release, so if you want to be welcomed every day with how many species you've added to your Western Palearctic list this year, you can. Scythebilll 9.3.0 includes a number of small but important improvements when importing data from eBird. Most importantly, eBird data downloads appear to have started using a variety of date formatting, varying from one user to another. (Seriously, eBird, cut it out...) I've added support for all the date formats I've had reported to me, but I doubt I've got them all. If you have any issues importing data from eBird, please let me know! It now accepts data downloaded from the "Your lists" section on eBird (for example). It should successfully import whether your preferences request common names, scientific names, or both (but only English common names). eBird is inconsistent across all its export formats with how it encodes non-English characters - like é, or ç or ñ, and so forth. Scythebill should now use the right encoding for each import, so location names with those characters should be imported correctly. Scythebill is no longer tripped up by the "Rock Pigeon (Feral Pigeon)" name in eBird. If you export data to eBird from Scythebill, one change will affect you. Instead of a dedicated button for exporting to eBird you'll have to first click Export... at the bottom-left corner of the reports screen. In the Browse by location screen, when saving a checklist with Save as spreadsheet..., Scythebill now correctly pays attention to the "Show everything", "Potential lifers", etc. option; so you can now save a checklist with just potential lifers, just endemics, and so forth. There's also a new option, "Species you haven't seen here". This would let you see, for example, all the birds in California that you haven't seen in California, even if you have seen them somewhere else. This lets you easily generate hit lists for sites you haven't visited yet. The Chinese checklist has been reconciled with the official checklist, as have the state checklists of Massachussetts, Connecticut, and Oregon. The world range of Eurasian Siskin should now be accurate (it was incorrectly omitted from many countries), and Wild Turkey is no longer marked as "introduced" in North America where it is clearly "reintroduced". In addition, there've been small corrections to the checklists of New Zealand, India, Taiwan, Malaysia, Brunei, Myanmar, Cambodia, Laos, Mongolia, Russia, Nepal, Namibia, Mexico, Ecuador, French Guyana, and Rhode Island. Thanks again for all the corrections, and again, please keep the "Verify against checklists..." results coming! Prior versions of Scythebill supported a "full" export format, with all Scythebill's data, with an Export... option in the File menu. However, it was all-or-nothing; you couldn't just export a subset of your data. This is particularly useful if you need to share your sightings between two users. Scythebill 10.1.2 - IOC 4.1 support! Scythebill 10.1.2 is now available! Download it here, and please follow Scythebill on Google+ or Facebook for updates. Scythebill 10.1.2 includes the IOC 4.1 list. This list was released only two days ago! So not only are taxonomy upgrades always free (of course), but they're also released faster than any other program. IOC ranges should be much better in this release, especially for species with large ranges - whereas earlier versions might merely say "Widespread", Scythebill now says "Widespread Africa" or "Widespread Pacific Oceans" (to give two examples). Of course, since Scythebill now includes checklists, this also means that all the country and state checklists have been upgraded to IOC 4.1 and ranges adjusted for the new splits. So I'll take this as another opportunity to plug "Verify against checklists..." in the File menu: please, try this against your life list and send me the results! Users' submissions have been invaluable in improving the quality of the checklists, so please keep them coming. When exporting reports as spreadsheets, you can now get a column containing counts. Thanks to Sharon W. for the feature request. Location entry now includes a (hopefully) more informative and intuitive display of the location hierarchy. Dragging "sp." sightings to species resulted in weird UI glitches and the potential for error dialogs; this has been fixed. Thanks to Ben N. for the report. Scythebill 10.1.1 is now available! Download it here, and please follow Scythebill on Google+ or Facebook for updates. Scythebill 10.1.1 almost entirely consists of bug fixes, some of which are significant. The most noticeable change only affects MacOS users, where a long-standing and painful issue with the "Open..." dialog is finally fixed. It now opens and shows results instantly. Custom checklists could not be imported for built-in locations. You got an error stating the file was corrupt, even though it wasn't. The "auto-magic copy-and-paste" feature is better at finding species. eBird imports were not always properly finding states (for example, you'd get a location named "MT" in Brazil instead of having records put in "Mato Grosso"). If you took the Scythebill eBird export, and reimported, it would drop the first record, and not always re-find locations correctly. Thanks to Keith M. for reporting. One small feature was added: when you're choosing dates in "Show reports", you can choose "is today" or "is this year". Scythebill now generates much better default names for exported .csv and .xls files. New Zealand, Kiribati, Malta, and the Maldives all now have built-in states. When saving files, Scythebill will warn you if you're saving over an existing file. Another 50 checklist fixes have been made. In particular, the Washington state checklist has been overhauled, and the Pygmy-Owls of the New World should now have accurate ranges (especially those in the "gnoma" complex). The next release (barring any urgent bug fixes) should incorporate the IOC 4.1 list. This will be a lengthier process than my usual rapid IOC uptake, as this will be the first time I've had to reconcile the IOC update with the worldwide checklists. Stay tuned!